Does it Matter if Microtransit is a New Idea? It’s “microtransit ” week at Human Transit, but this post is not the place to start. If you want the full exploration of microtransit’s impacts, which are not all wonderful, start here. If you’re curious about whether microtransit is a new idea (it doesn’t seem to be) start here. On Friday, I asked if “microtransit” is really a new idea. I asked that because a public relations campaign telling us that it is a new idea has reached every corner of the transit world, and clients of mine on several continents are wondering how to “respond” to this “innovation.” You’ll want to read that short post before this one. So the main new thing seems to be the IT: the apps that take care of hailing, navigation, and payment. And in that case, the statement that transit agencies should fund microtransit is equivalent to saying that they should upgrade the old idea of flexible-route services to include the use of IT. And if that were all there were to it, then it would certainly not need a brand name like “microtransit,” let alone this massive public relations campaign. Does the new approach have potential? I disagree. To call a transit idea new, or an “innovation,” is to imply that the idea has no history, and that experienced transit professionals knew nothing about it until the innovation came along. This discourages people from asking experienced transit planners about it. It’s a very effective way of excluding a lot of expertise from the conversation. So yes, we must think about “microtransit” in the context of the public relations campaigns that are promoting it as a “new” idea. If we’re going to think about the public interest rather than the interest of the technology vendors, it is entirely appropriate to be skeptical (not cynical) about ideas that seem to be prevailing mainly through repetition. In other words, we must lean into the wind. Skepticism (unlike cynicism) is a position of curiosity. I am not arguing against microtransit, but I want to understand the idea well enough to advise my transit agency clients about it. For that reason, I’m looking for arguments for it — and for its newness — that stand up to reasonable scrutiny. And I’m still looking. NOTE: The next microtransit post, exploring whether it is a logical solution to actual transit agency goals, is here. Is Microtransit an Actual Idea? Are Apps Really Transforming Urban Transportation? 14 Responses to Does it Matter if Microtransit is a New Idea? HSL in Helsinki region run quite a large trial of such service from 2012 to 2015. Interface was web based, but otherwise pretty much the same thing. There is a comprehensive report available but in a nutshell: Service was popular, but also prohibitively expensive to run. The KutsuPlus company did manage to bring costs down with scale as expected, but it was still 20€/trip when it was terminated, which about ten times more than for other HSL public transit. Some critics called it a subsidized taxi for middle classes, and I think I agree. While I fundamentally agree with the premise that microtransit is just a variety of DRT concepts reimagined, I don’t have quite the same negative perception of this. 1. I don’t agree that it is always a bad thing to highlight something that’s been around awhile as “new” when it just has a new feature or wrapper. We opened a new rapid bus line with a terminal at a regional shopping mall. When I heard people exclaim: “Now I get to the mall on transit.”, part of me wanted to scream. They could get there on transit for years, they just never tried. The other part of me was just happy they now considered the mall part of their transit geography. Similarly, if new features and a new wrapper make DRT services seem like a good idea to folks, then go for it. 2. I also think that you can’t just look at “microtransit” services in isolation, or even only in combination with fixed route. Part of what the apps, and the branding of “shared mobility” or “new mobility”, do is package a whole range of modes, and multimodal trip options, together. So if bike sharing and car sharing and dynamic carpooling and ridehailing all exist in the palm of my hand, putting “microtransit” squarely in the midst of all of those is important. So yeah, the service isn’t really new. And the problems of geography haven’t gone away. And the cost effectiveness isn’t magically going to improve. But there is still something here I think we should pay attention to. It think this post asks entirely the wrong question. One of the other commenters in the original thread said it quite succinctly – you’re undervaluing the transformative potential of the app. Look at Amazon (or e-commerce in general). There’s nothing *new* about Amazon. It’s mail order delivery plus a website. Many existing retailers dismissed the importance of e-commerce for exactly that reason – they had decades of experience competing with mail-order catalogs. To their eyes, this was nothing “new.” Just mail order plus some new IT. So e-commerce was nothing more than telling existing retailers that they should add some IT. But look how *that* turned out. The application of technology to that old business model enabled enormous disruption and change in wide swatches of retail. It ended up being new *enough* to destroy the business models of a number of existing incumbents – and the fact that some of those incumbents also had websites didn’t save them. Because the IT enabled some rather profound changes in the execution of the not-new business model that ended up being very consequential. So while it’s true that experienced transit planners might have a lot of knowledge about how ‘analog’ microtransit has operated historically, that doesn’t necessarily mean that app-driven mictrotransit services aren’t different enough – *new* enough – to have characteristics that depart radically from that experience. It’s certainly possible that it won’t, and possible that transit agencies might be able to achieve similar things by just “bolting on” some extra IT into their existing systems in a way that many legacy retailers could not. But to dismiss this as just business as usual with some IT changes might end up being severely short-sighted. When I try to make a more precise spin on your analogy with Amazon, I can’t make it work. On the other hand, making this more precise claim also makes Jarrett’s argument more incisive. Have microtransit boosters ever tried to use Google Maps? That also puzzles out transit services for you. And Jarrett’s point on this blog is that many transit systems are overly complex, even without IT competition. Is it possible that microtransit is so popular only because US transit agencies are behind the times in their network design? Even if the problem is IT, (most) transit agencies tend to have few riders that travel across agency boundaries, so an app characteristic of their local agency will serve most riders’ needs; the problem *is* just business as usual with a new app. An even more cynical take on this is that Amazon actually has *not* been transformative; it didn’t start making money until it predatorily priced itself into a quasi-monopoly position. In which case…is microtransit the new Uber? Amazon also put a lot of work into providing detailed product specs and pictures of the product (including photos from all sides for electronic equipment), as well as customer reviews. All this helped to win over people who were reluctant to shop at Amazon or at any mail-order seller. It also attracted people through discount prices, and reasonably reliable delivery dates and return policies. The translation to TNCs is the app, and while the app makes hailing more convenient and tells you whether a car is nearby, that doesn’t seem to be nearly as much of an advance as Amazon has put into its website. My thought is that the term “microtransit” isn’t helpful, simply because it’s so poorly defined. It suggests that the economics of running small transit-like services will suddenly improve with better apps and data, when the fundamental challenge of small transit services is that cost is distributed over a small group of riders traveling in only one direction. This explains (to me at least) why the initial examples of this type of service seem to cater to rich tech workers and offer luxury features. On the other hand I think there is value in considering how big data and immediate mobile access to potential customers could allow for more customized transit solutions. 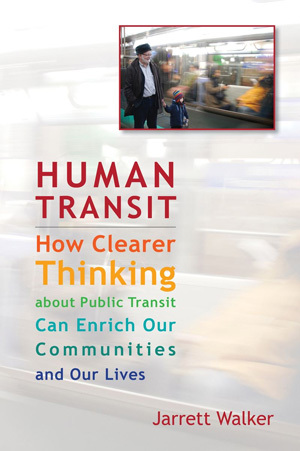 What comes to my mind is a far more aggressive role for public agencies recruiting and facilitating formation of vanpools, which fill an important niche serving groups of customers to dispersed destinations where transit would not be feasible or cost-effective. In my area, there is a standard rideshare website people can go to if they want to find a carpool or vanpool, but people need to go out of their way to access it. I’m not sure we’ve done as much as we could to aggressively attract new customers and facilitate the formation of vanpools, and I’m guessing that there must be ways (or waze) to make use of big data and integrate the marketing of vanpools into more widely used apps. I look at the microtansit and the regular bus services as the sprinkler in my backyard. The old manual sprinkler = regular bus services. The new smart sprinkler = microtransit. Both will do the job but one will do it more efficiently. The real innovation is behind the app with the algoritum. So when it’s rain, the smart sprinkler will shut down so I don’t waste my resources. With the regular service, you might see many trips with empty buses, but the algorithm may help you to lower the cost and save your resources. At the end, microtransit is a compliment for the transit service. It will help the transit agency to increase the coverage more efficiently. They are two different things. Buses can move more people more efficiently. That’s important in some areas. In other areas it doesn’t matter, and there the lower cost of the small vehicle becomes a more significant factor. So microtransit is not really a new smart sprinkler, but a small sprinkler, and just like a mouse it can go through small mouse holes that cats can’t or it’s not worth their time. I think there is new involved. Look at the ease of getting an Uber (5 minutes) vs. the slog of getting a transit-provided paratransit trip (a day in advance). However, part of this is a new idea in service delivery…..contractors and clients get more information with the app. I see lots of opportunity for new services, with a plethora of service options. The one thing I don’t see is combinations of services. No matter the app or the algorithm, there still is one analog roadblock. Transfers. People hate ’em. And for good reason. They are inefficient, they waste time and money. So, many, if not most trips will still be single vehicle trips, especially those that are priced at a premium. So, I still see that microtransit will corner the low volume many to many services and transit will still have a large percentage of the high volume market. A question. Haven’t we just been through this recently? When Uber came out with Uber Pool, it was the death of transit, the death of shared rides. And, it wasn’t, not by a long shot. Did they provide a premium service? Yes. Better than publicly provded? In many cases, yes. Do they rule the world in vanpool type shared ride? Not by a long shot. Uber hit the same brick wall that public transit vanpools have. It’s the old Elon Musk issue to a lesser extent (sorry, Jarrett)–“People are icky.” Most of us don’t want to ride with others. Or we don’t want to make those changes that negatively affect our utility. Even if people are wrong about riding with others, we can’t do a lot to prove our correctness. One thing that many people claiming a brave new world for micro-transit seem to forget is that they face the same economic and psychological hurdles as conventional public transit. There are many reasons why the car is king in America. And the current models for the new micro-transit don’t address these any better than conventional transit and micro-transit. One thing I’ve noticed is riding in a shared-ride service (e.g. UberPool) has a very different feel compared to carpooling with friends to social occasions. When you stop somewhere on the way to where you are going to pick up a friend headed to the same place, it’s primarily about socializing, and offering a ride is about doing the right thing/helping out a friend/repaying the favor for that other time when your friend did the same for you, not saving a couple dollars worth of gas. Now, let’s imagine the UberPool scenario. Any passengers you meet are going to be strangers that you haven’t met before, and are unlikely to ever meet again. This time, there is no “you scratch my back, I scratch yours” motivation, and the ride sharing becomes all about the saved dollars and cents. Worse, since Uber charges you the same amount for UberPool, whether you’re matched with anyone or not, and most UberPool rides seem to go unmatched, the actual ride matching, itself, becomes not even about saving your own dollars and cents, but Uber’s. Suddenly, each detour to pick up or drop off another passenger feels like overhead that Uber is adding to *your* trip to save *Uber* money, rather than helping out a friend. Curiously enough, riding an actual transit bus does not feel this way. In large part because transit buses travel along mostly straight lines, while following a published route with a published schedule, so you know exactly what you’re getting into before you sign up for the trip, and have no surprises. It also helps that transit buses are much more efficient at getting lots of people on and off the vehicle quickly than passenger cars, and that transit buses don’t hold everybody else up for one person running late. Yes – there are some trips where the transit agency does such a horrible job with the routes and schedules, that even worst-case luck with UberPool is still way faster. But, if the agencies could be adequately funded (and run the buses frequent grids is straight lines, rather than routes that constantly loop back and forth, trying to private a one-seat ride to everywhere), these types of trips would be exceedingly rare. One positive of Uber Pool and shared rise sevices is for short first/last mile trips to/from a transit station. The ride perception is not much diiferent from an airport shuttle making drops at several hotels. Where this completes a trip where transit comprises the majority of the trip travel time, I think there is a market which like many new ideas will take time to catch on. It is not just App IT for navigation, demand, and payment. the microtransit concept is a layering of app based organization, internet of things communications, shared mobility concepts including bikes, and advancements in Electric fuels and renewable energies. It’s a nexus of ideas that leverage the re-prioritization of people first in mobility choices. Solar energy has been around for 50 years, it doesn’t mean we gave up rethinking the technology and strategizing implementation to realize its benefits. Today’s microtransit is a comprehensive rethinking of new and old ideas. Maybe it’s possible that past experience and any failures of past experiments, are narrowing the translation of Eno’s Definition? In order for Transit to compete with the perceived convenience and relative independence of the private auto, it needs to be equally convenient/accessible, plus affordable, fast, and reliable. When a person leaves the house, they are going door to door, regardless of which mode(s) they choose. Autos offer complete single seat door-to-door service. For microtransit, a door to door trip does NOT mean a one-seat ride door to door trip like the automobile. It is instead a seamlessly planned and paid for complete trip using two or more modes, that offers comparable convenience and cost to an SOV. Today’s app technology offers an opportunity for transit to improve its ability to compete with this door to door model. Microtransit should include TNC car, TNC shuttle, or bike share, maybe even walking or Segways and other personal mobility devices. Also important to note, Microtransit TNC doesn’t mean autonomous operations, though autonomy is an evolution of current TNC operations and trends. As you often point out, The time an automobile takes to complete a door to door trip is based on the limits of geometry, current system congestion within that geometry, and the time penalties afforded by potential barriers (signal cycles, pedestrians crossing times, accidents, time it takes to find a parking spot, etc). The layering of app based technologies with the internet of things technologies, such as vehicle to signal and vehicle to vehicle communications, can improve the performance of Transit, and increase its accessibility and convenience. Eventually, Autonomy will improve the cost by reducing employee overhead. App based technology allows microtransit users the front door on-demand convenience of the car in their driveway, with some minor habit adjustments. It will also provide complete end to end trip planning and payment. Vehicle to signal communications can give microtranist priority at signals, while communications with trains and buses and app algorithms can help time the transfer, or adjust drop off location to varied points along High Capacity Transit to minimize wait time during the transfer. (i.e. Based on location, distance, and travel time, I will miss the train at this station, but can connect to at the next station). Combined, these add efficiencies to a door to trip that uses more than one mode. One could say it is an an advancement on the Park and Ride model, that adds capacity, and increases access to transit, without the cost of expensive parking structures. Microtransit is also about geography and infrastructure. It may be its best function is as a localized extension of transit operating at low speeds, within limited geographic outer urban and suburban zones, to pick up users at their door and transport them to nearby stops for High capacity transit lines such as frequent service bus routes, LRT, or BRT. In the urban core, SOV TNCs already diversify mobility choices for short trips (or more accurately it simply revitalized the role of taxis). Higher capacity Microtransit TNC shuttles could improves the efficient use of geometric space in urban centers. More effective Microtransit can also assist a portion of paratransit users with accessing transit to utilize existing systems rather than expensive paratransit, both lowering the travel expense for the users, and reducing the costs of paratransit operations for agencies. Smaller scale Microtransit service could also assist with stop consolidation, improving overall transit times and reducing maintenance costs. These services can also provide increased access between local town centers and commercial nodes within one geographic area. Adequate transit planning could help agencies facilitate an intentional shift from low ridership, off-peak, low frequency fixed bus routes, to small scale microtransit service zones. The funds from these routes can shift to providing more high frequency service routes in locations where demand is there, but budget restrictions limit expansion. Microtransit fares will only be one source of revenue. If fares are trip based, not mileage based, Fare income could potentially increase with higher volume of riders per hour afforded by shorter trip distances. Ad revenues on private vehicles and on apps could be a more significant revenue stream. Additional in-vehicle services could diversify revenues. The sale of Internet of things data could also increase revenues for public agencies. Service sponsorship by local and national business entities could also offset costs. Electric and autonomous technological advances will continue to reduce operational costs. Liability risks are also reduced with low speed, limited range restrictions (i.e. the shuttle doesn’t cross a high volume street in this zone, so risk is greatly reduced). This ia a really interesting discussion. Similar pilots are underway in Sydney, bridj is one provider. Im interested by the potential for accessible, preferably low floor micro transit to replace paratransit schemes with a better service. Sadly, focus here is only commuters and the pilots are all inaccessible to wheelchair users. Home › General › Microtransit › Does it Matter if Microtransit is a New Idea?